On May 1, 1883, the New York Gothams welcomed the Boston Beaneaters to the old Polo Grounds and defeated them 7-5 to begin an unbroken string of National League baseball that spans 120-plus years and both coasts of the United States. Within two years the team became known as the Giants. They would win two pennants in the 1880's, but by the turn of the new century they were floundering. In a seminal decision for the franchise, owner Andrew Freeman hired John McGraw, one of the game's most prominent and pugnacious personalities to manage the team. McGraw ruled with an iron fist for the next 30 years, his bare knuckle brand of baseball delivering 10 pennants and World Series titles in 1905, 1921 and 1922. After a second place finish in 1903, McGraw won his first pennant a year later relying heavily on what would become a legendary pitching rotation led by Christy Mathewson (30 and 33 victories in 1903-04) and Iron Man Joe McGinnity (31 and 35 wins). Mathewson was the best pitcher of his era, finishing with 373 career wins (third most in history) and a career 2.13 ERA across 17 seasons. He would be one of the five original inductees into the Hall of Fame. McGraw refused to recognize the American League as co-equal with the National and he would not play their pennant winner (Boston) in the 1904 World Series. But when his pitching staff sparked the Giants to another pennant in 1905, new baseball rules compelled McGraw to participate in the postseason championship series. He came fully armed with Mathewson (32-8, league leading 1.27 ERA), McGinnity (22-16, 2.87), Red Ames (22 wins), Dummy Taylor (15) and Hooks Wiltsie (14) and his "Jints" whipped Connie Mack's Athletics in five games. After some uneven seasons, the Giants inaugurated the new Polo Grounds with three consecutive pennants (1911-13). But the American League got a measure of revenge against McGraw for his 1904 slight by winning all three World Series. McGraw had his Giants roaring into the 1920's with four pennants in a row (1921-24). His roster was packed with future Hall of Famers including George Kelly, Ross Youngs, Dave Bancroft and a young Frankie Frisch, all of whom hit over .300 in each of the four seasons. In the postseason the Giants won the 1921 and 1922 Series before the Yanks turned the tables in 1923. The Washington Senators spoiled McGraw's last World Series with a seven game victory in 1924. McGraw finally called it quits 40 games into the 1932 season and was replaced by star first baseman Bill Terry. Terry had been the toast of the town in 1930 when he hit .401 (the last National Leaguer to do so), and his lifetime .341 mark earned him a ticket to Cooperstown. Terry's team won the pennant and the World Series against Washington in 1933 and they won back-to-back pennants in 1936-37, although both of those teams were buzz sawed in the World Series by the Yankees. The mainstay of Terry's pitching staff was Carl Hubbell, a crafty southpaw with a disappearing screwball. He won 20 games for the first time in 1933 and then did it five consecutive years. The Giants also brought up a fresh-faced 19-year-old outfielder in 1928, and although he was not physically imposing, Mel Ott would power his way through 20 seasons and finish with 511 career home runs, the most hit by a National Leaguer to that time. Ott would follow Terry into the manager's chair in 1942. Although the Giants were not winning, they continued to have a searing, white-hot rivalry with the Brooklyn Dodgers, which was why New York City was shocked when the Dodgers long-time manager Leo Durocher agreed to replace Ott in the middle of the 1948 season. During this time the Giants brought up the "Say Hey Kid"  Willie Mays, and 1954 was his breakout year with 41 home runs, 110 runs batted in and a .345 average. By the time he retired in 1973, Mays had 3,283 hits, 660 home runs, a slew of franchise and National League offensive records and he could lay claim to being the greatest center fielder in National League history. Despite Mays as a drawing card, attendance at the crumbling Polo Grounds dwindled, and owner Horace Stoneham did what only a few years earlier seemed unthinkable  he moved the team from New York City to San Francisco in 1957. 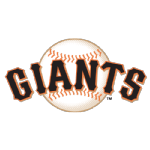 Even with a surprising 2010 world championship the Giants have not enjoyed the success in California they had in New York, winning only four pennants (1962, 1989, 2002 and 2010). They did flex considerable muscle during their first decade out west. Sluggers such as Willie McCovey, Orlando Cepeda, Felipe Alou, Jim Ray Hart, Bobby Bonds and Harvey Kuenn joined Mays in slamming baseballs all over windswept Candlestick Park. High-kicking mound ace Juan Marichal kept the Giants in contention almost every season. The 1962 team featured Mays (49 home runs, 141 runs batted in, .304) and Cepeda (35 home runs, 114 runs batted in, .306) in their prime, although they lost a seven-game squeaker of a Series to the Yankees. The 1989 team, managed by Roger Craig and led by Kevin Mitchell's big bat (47 home runs, 125 runs batted in, .281), were swept by Oakland in a Series remembered more for an earthquake than for the games themselves. The Giants brought in free agent Barry Bonds in 1993, and his big 2002 season (46 home runs, 110 runs batted in and a league leading .370 average) propelled the Giants to the wild card slot and the pennant. The Giants again found disappointment in the World Series, however. They led the California Angles three games to two, only to blow a late 5-0 lead in Game Six and lose Game Seven 4-1. Bonds produced one record-setting season after another as the Giants moved into Pacific Bell Park (since renamed AT&T Park in 2006), averaging nearly 45 homers in 15 seasons in San Francisco before his career ended after the 2007 campaign. He set the major league single season mark of 73 in 2001, and in 2004 became only the third player to reach 700 for a career. He eventually passed Babe Ruth (714) and Hank Aaron (755) to finish atop the all-time homer list with 762. He also won an unprecedented seven Most Valuable Player Awards, including four in a row (2000-04). The Giants built their teams around Bonds, but didnt make the playoffs again after 2003 during his career. They broke through with an unexpected world championship in 2010, defeating the Texas Rangers in five games with shutdown pitching and timely postseason hitting. Stalwarts on the mound included Tim Lincecum, Matt Cain, Madison Bumgarner and closer Brian Wilson. Veterans Aubrey Huff (26 homers, 86 RBIs, .290 average), Juan Uribe (24 homers, 85 RBIs), Pat Burrell (18 homers) and Freddy Sanchez (.292 average) led the offense. Major contributions also came from rookie catcher Buster Posey (18 homers, 67 RBIs, .305 average), who handled the young pitching staff like a veteran, and shortstop Edgar Rentaria, who overcame an injury riddled season to win the World Series MVP award hitting .412 with two homers and six RBIs. The New York Gothams played their first Major League game on May 1, 1883. Their opponent was Boston and they defeated the Red Stockings 7-5 at the Polo Grounds . How did they become known as the Giants? The "real" truth might not ever be known, but many sources credit Jim Mutrie, the franchise's first manager, who would often shout, "My big fellows! My giants!" Did you know that when the San Francisco Giants defeated the Los Angeles Dodgers 8-0 on April 15, 1958 , at Seals Stadium it was the first regular season Major League game played on the west coast of the United States?